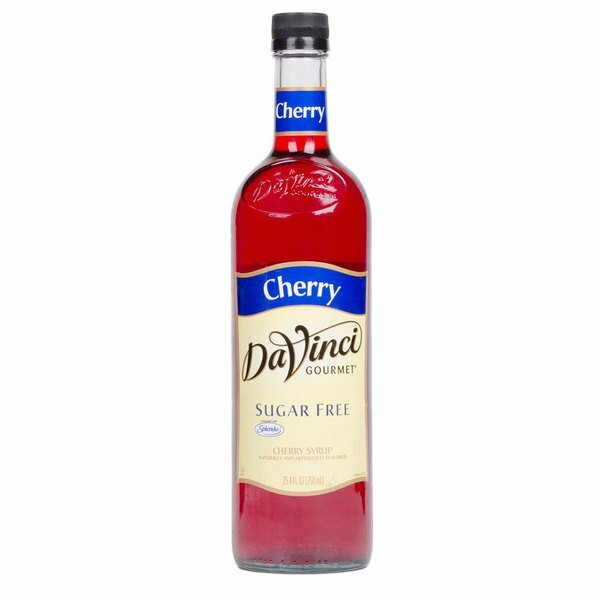 This user-friendly bottle of DaVinci Gourmet sugar free cherry flavoring syrup allows your busy baristas to quickly and easily serve up delicious hot, cold, or blended drinks with irresistible flavor without the sugar content! DaVinci Gourmet flavoring syrups complement your beverages without overpowering them or being too sweet. They are specially formulated to resist curdling in milk and hold up well under heat, making them the perfect choice for espresso-based drinks, brewed coffee or tea, and more. 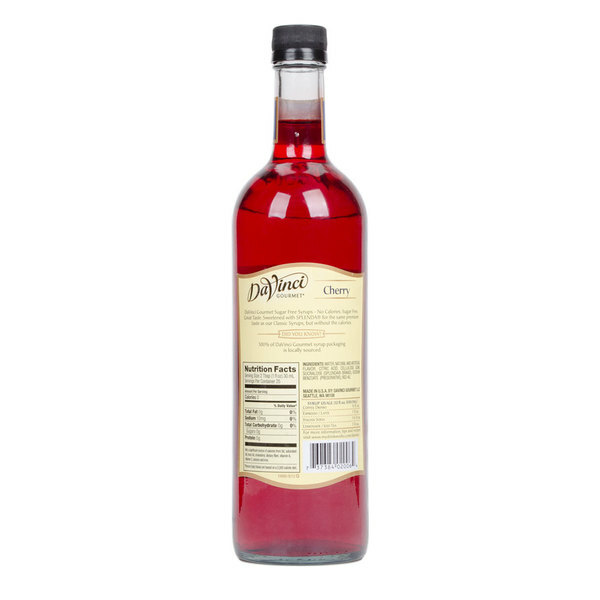 Add a shot of bold cherry flavoring to any Italian soda, snow cone, fruit punch, or mixed drink with this DaVinci Gourmet sugar free cherry flavoring syrup! Featuring the taste of fresh-picked red cherries, this syrup features an eye-catching red color and sweet yet tart flavor. Try drizzling it on a cherry cheesecake for something new! Sweetened with sugar free, no-calorie Splenda Brand Sweetener, this sugar free blend is sure to be a treat for your health-conscious patrons! Splenda tastes like sugar, giving you great flavor without the calories. Sold in gourmet coffee shops, specialty food stores, food service outlets, and grocery stores, DaVinci Gourmet products, like this sugar free cherry flavoring syrup, have a long history of commitment to quality and superior taste. This is my go to syrup for my diet sodas. Just add a splash to my beverage and enjoy. Tastes like the juice from the cherry jar! Highly recommend! We have a created a whole line of sugar free cocktails and it all started with this cherry flavor. All the other DaVinci sugar free syrups are just as good. My favorite sugar free cherry syrup. I use it for diet cherry limeades. Mix it with some lime juice and diet sprite and you have a zero sugar cherry limeade that tastes amazing! This is very good. Has a nice bright flavor that doesn’t taste like candy. It is very good mixed with a little chocolate in coffee and even better in hot cocoa. Great flavor. Came undamaged in good packing. The order was filled in a very timely manner. Love the reduced price for ordering multiple items ! Love making my shakes with this amazing syrup. Sugar free product & guilt free. So many options available. Great product for my smoothie bar. I will always buy my syrups here. I did not expect this to taste as good as it did when I first ordered it. I was surprised when I first tried it though and now I just bought my 4th bottle. The cherry sugar free coffee flavoring syrup is great. The syrup is perfect for making our chocolate cherry Frappuccino drink. The cherry flavor is bold and delicious. The sugar free cherry coffee flavoring is marvelous. The cherry flavor is so real and delicious that I can not believe that it is sugar free. A great flavoring for soda or coffee. Cherry has an interesting cherry flavor that i absolutely fell in love with! great taste and awesome to mix with shakes! I would recommend to everyone! Awesome for making your own cherry coke! just like the old fashioned soda fountains!! It's also great on vanilla ice cream. Great with sugar free seltzer water for a refreshing treat! It does have cherry flavor and smell to it. It can be used however other cherry flavorings are used. This one was most enjoyed in hot cocoas and on banana splits. I do not personally like splenda. We've been using this to make both coffees and flavored, zero-calorie water. The taste is good, and it does a good job mixing with whatever you are serving. Wish it was color-free, but that is a small issue. As always, ordering from Webstaurant store is extremely fast and easy. Great service. But the sugar free cherry tastes like an extremely watered-down cherry punch mix. Not something I've enjoyed in any of our drinks, so this is a flavor I'll be avoiding in the sugar free variety.